Harry Forbes is definitely from So Ron. It shouldn't be. John Linklater fought in World War One. The man fifth from the right David Eunson? looks like he would take on the might of the German Forces single handed!. This is the third or fourth name attributed to this man - can you supply any further info? Looking at the picture, 4th from left is definitely William John Dickson, confirmed by his daughter, my mum. We can provide more details if required. The one in the middle is my father, John William Dickson, manager of the then Union Bank (opposite the Big Tree in Albert St) from 1939 till his retirement in 1953. 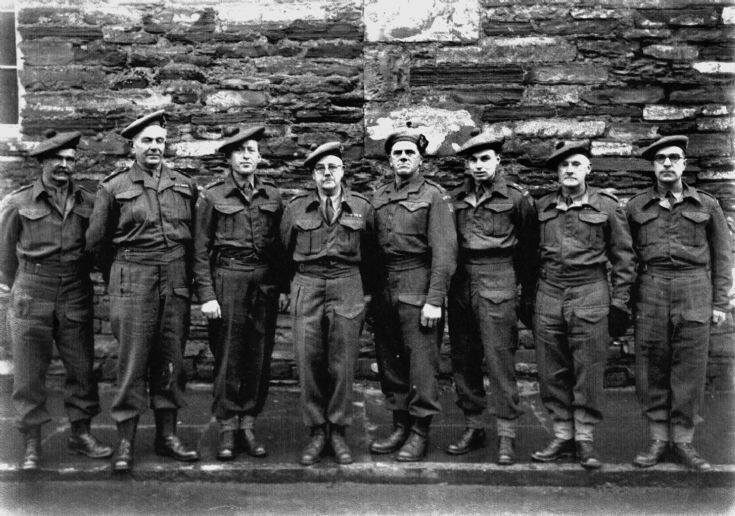 He was one of the founder members of the Kirkwall Home Guard. Born August 1886 died 1995. Which one is the 'middle' of eight Elizabeth? Anyway, he must have been doing something right, given he lived to 108 years old. 4th from the left as you look at it. He was 99 when he died, so a bit of a typo there. 1985. In case mum, Elizabeth Ferris doesn’t see this it is the gentleman 4th from the left with the glasses and moustache and it was 1985 that he died, just failing to make it to 100. Seeing as he was gassed and blown up in WW1 he didn’t do badly! !